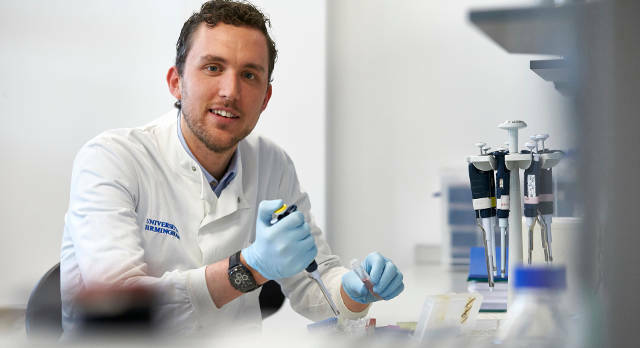 NIHR Surgical Reconstruction and Microbiology Research Centre Research Fellow Jon Hazeldine enjoyed a double success recently when papers on which he was the lead author were published within a few days of each other. Jon’s paper ‘Immunesenescence and inflammaging: A contributory factor in the poor outcome of the geriatric trauma patient’ was published online by the journal Ageing Research Reviews quickly followed by ‘Traumatic brain injury and peripheral immune suppression: primer and prospectus’ in Frontiers in Neurology. Both are review articles summarising the current thinking in the relevant fields and draw a series of hypotheses that Jon and his colleagues are testing in their ongoing SRMRC-supported Golden Hour study and the Healing Foundation-funded SIFTI trial. “Enrolment into the SIFTI study is complete and the Golden Hour study is ongoing and we believe we will generate enough data to test out the hypotheses we have put forward in these papers,” said Jon. “The first paper was written with my colleagues Dr Peter Hampson and Professor Janet Lord and considers the impact that patient age has on outcome following traumatic injury. The second paper was published with Professor Tony Belli and Professor Lord and focuses specifically on traumatic brain injury (TBI), again looking at the immune system. “We’ve looked at what research is already out there, which shows that suppression of the immune system is greater after brain injury than other forms of trauma. The Golden Hour study explores how quickly following traumatic injury the function of the immune system is altered, whilst the SIFTI study investigates, among other things, the immune response of patients who have suffered severe burns.